Welcome to our site. We are dedicated to small scale radio controlled cars and Park/Slow Flyers. 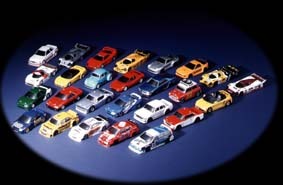 Including:Hpi Micro Rs4, Kyosho Mini Z, Mini X 4wd, Abc Hobby Dtm Sp Pocket Racer, Abc Hobby Dtm-X4, Tokyo Marui R/C Club Best Collection, Tamiya Tamtech, and Epoch 1/43 Indoor Racers. Electric Planes: Firebird Xl, Tiger Moth, and Pico Stick. Just Added to www.MicroRcRacing.com Team Losi MIni T, Tamiya Rock Buster TLT 1/18 Mini Monster Truck, Mini Z Monster, and Xray M18 shaft driven 4wd 1/18 micro car. Please visit our new site which includes a larger Micro R/c car product line: Losi Mini T, Mini T Pro, Associated RC18T, Hotbodies MiniZilla, Trinity Itsy Bitsy Spyder, Mini Quake, Xray M18, Xray M18T, etc 1/64, 1/43 to 1/18 scale R/C Cars! We also have a R/C race track and use Ko Propo automatic lap counting. We have fast shipping and over 60,000 products at our disposal. Let us be your source for micro rc cars. Thank you for visiting and come again. Money orders and Cashiers checks accepted. Please e-mail us with your order and we will e-mail you back an invoice.